Everyone in the kitchen! 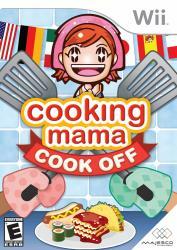 Hot on the heels of stir-fry surprise Cooking Mama DS, Majesco whips up two-chef competition in Cooking Mama: Cook Off�a unique family game designed specifically for the Wii. Step-by-step, recipe-by-recipe, help Mama cook international dishes from 10 different nations and watch as the realistic foods actually change in appearance based on your actions!